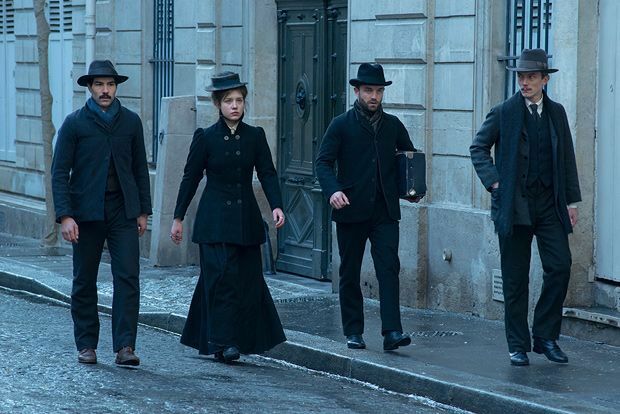 There is so much potential in The Anarchists (Les Anarchistes) that it is all the more disappointing when it settles for being a perfectly respectable, well-crafted, slightly dull period piece. You expect emotional fireworks and intense drama from a film dealing in righteous anger, moral ambiguity and how far you are willing to go in testing the courage of your convictions. Set in the Paris of 1899, The Anarchists could be a tale from the pen of Émile Zola and also bears a passing resemblance to the undervalued Martin Ritt / Sean Connery collaboration The Molly Maguires (1970). Ambitious brigadier Jean Albertini (Tahar Rahim of A Prophet and The Past fame) is ordered to go undercover to infiltrate a group of 'dangerous' young anarchists challenging the inequalities and injustices of the age. The book-loving orphan eagerly embraces the opportunity to reinvent himself, quickly abandoning any ties to his current life and becoming a downtrodden worker in a nail factory. Jean makes all the right noises about his hatred for the bosses and is eventually embraced by the group and befriended by the leader Elisée (Swann Arlaud). He is also swept into a romance with Elisée’s girlfriend Judith (Blue Is the Warmest Colour's Adèle Exarchopoulos) adding a personal dimension to the growing conflict between the pursuit of his mission and the claim on his loyalties. Cinematographer David Chizallet creates an atmospheric vision of late 19th century Paris in steely blue mornings and smoky, shadowy nightclubs and director Elie Wajeman adds an element of nouvelle vague bravado in musical choices that include The Kinks' 'I Go to Sleep'. The problem lies in a central romance that seems perfunctory and in an all-too predictable story where everyone is remarkably willing to accept the mysterious Jean as one of their own. Limited release from Fri 6 Nov.